Adventurous, risk-taking bartenders are starting to infuse their cocktails with savory deliciousness. Here, six umami cocktails from bars across the country. You probably already know about umami, which can essentially be defined as yumminess. You'll experience this somewhat mysterious taste in extremely delicious foods such as mushrooms, cured meats and oysters, but aside from the Bloody Mary (whose tomato base is packed with umami-saturated amino acids), cocktail culture has been largely devoid of the fifth taste until now. Adventurous, risk-taking bartenders are starting to infuse their cocktails with savory deliciousness. Here, six umami cocktails from bars across the country. At Bryan Voltaggio’s Range in Washington, DC, bartender Dane Nakamura has created a wondrous thing called “meat ice.” To make it, Nakamura combines San Marzano tomato water with trimmings of cured meats, raw beef and vegetables, Old Bay, bay leaves and a mirepoix of carrots, onion and celery in a pressure cooker. He cools and clarifies the stock, adds egg whites and a splash of pig’s blood for good measure, then freezes the mixture. 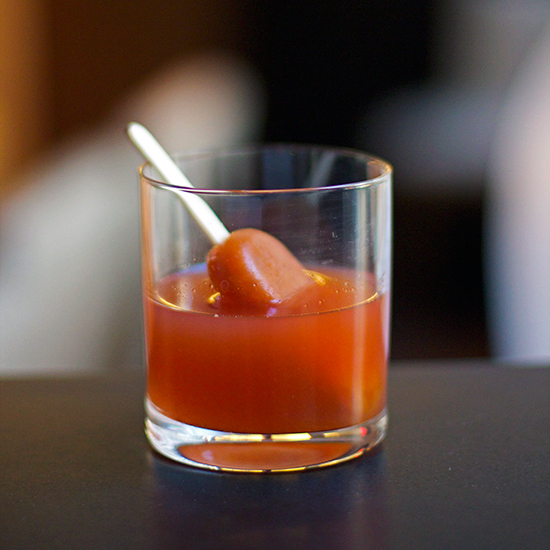 The ice is used in the Vegan Sacrifice, a spicy, smoky cocktail made with Scotch, ginger ale and cayenne. As the ice melts, the cocktail becomes more and more savory. Served at Plan Check’s Downtown L.A. location, the Whickle Back puts an Asian spin on the classic pickleback shot. Chef Ernesto Uchimura infuses pickle brine with kombu, a type of seaweed often used in Japanese dashi. The salty, sour, savory brine is served as a chaser with a shot of Jameson Black. For the uninitiated, natto is a Japanese dish of gooey, slimy, fermented soybeans. Pungently flavored, it’s a love-it-or-hate-it food—mostly because of the off-putting texture. But at Roy Choi’s POT in L.A.’s Koreatown, the natto-curious can experience the flavor without risking the slime in the Natto Soju. Bartender Matthew Biancaniello infuses soju with natto for about a week before straining it out. What’s left is a nutty, almost caramel-flavored spirit, which Biancaniello shakes with muddled cucumber and shiso, lemon juice, agave syrup and Aperol. Strained into a coupe, the cocktail is a balanced mix of bitter, sweet, sour and umami. Along with kombu, bonito flakes (dried, fermented and shaved tuna) are the main ingredient in dashi. At Neta in New York City, bartenders use it to infuse smoky Suntory Hakushu Japanese whiskey for the Severed Anchor cocktail. To make the drink, bartenders mix the infused whiskey with Bushmills and Tenryo Hidohomare sake. Slightly fishy, nutty and boozy, the cocktail is garnished with a flower made of bonito flakes. There’s a double dose of umami in A Dirty Decision, served at San Francisco’s Dirty Habit. First, there’s the chanterelle-infused amontillado sherry. Then, there’s a black garlic tincture. Also in the stirred, chest-warming cocktail: Noilly Prat Ambre vermouth and orange bitters. For an ultra-luxe cocktail, bartenders at NYC’s Analogue macerate black truffles in a honey thyme syrup for a day and a half before using the aromatic syrup in the Black Gold cocktail, which also includes lemon juice, Green Chartreuse, hazelnut liqueur and egg white.